Users wave their mobile device around the areas of a room where the listener most often is, while the speaker emits a series of blips and tones covering a whole range of frequencies. The app senses where in the room that sound is obscured and compensates using a smart equalizer. While it adjusts levels to create the neutral studio sound the speaker was originally tuned to, a user can later manually raise the bass or make other tweaks. 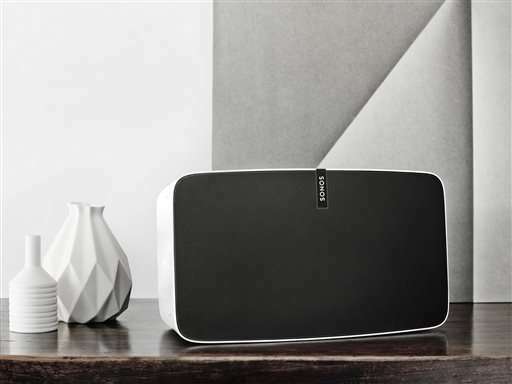 In a demo for The Associated Press, sound from a Sonos Play:1 speaker positioned under a chair and behind a couch sounded muffled with the software feature off, but crisp and louder with it on. The software feature, called Trueplay, will work for millions of users of Play:1, Play:3 and Play:5 speakers that have already been sold. The upgrade currently only works when the app is used with an Apple iPhone or iPad 2 or newer, by utilizing the device's microphone. The Santa Barbara, California, company also said Tuesday that it is releasing a new Play:5 speaker that is bigger than the previous model, has touch controls that respond to swipes, and responds to being placed horizontally by widening the sweet spot where listeners can hear in stereo. The new Play:5 costs $499, which is $100 more than the previous model. The new speaker comes with two embedded microphones that aren't functional at launch but could be used in later software updates. 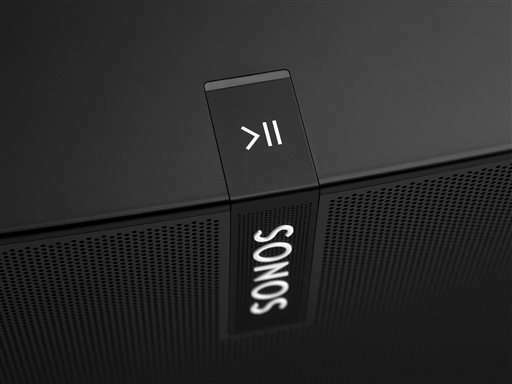 Sonos has helped define a category of speaker that does away with discs and cassettes and instead relies on music streamed from your mobile device, computer or over the Internet via services like Spotify, Pandora and Amazon Music.